Now that the castle gates are open, Anna and Elsa are thrilled to be finally getting to know their kingdom. Anna bubbles with enthusiasm for all the things to do and the people to meet in Arendelle, and Elsa loves using her magic to help the town. But sometimes even a queen needs a day off. After years apart, Anna and Elsa are finally getting to know each other as sisters. But Anna still wishes she could remember the magical times they had together when they were younger-skating and making snowmen, even in the middle of summer! An eager young troll claims he can restore the memories that Pabbie removed, but Elsa's not so sure. Maybe it's time to make new memories! Olaf has news for Elsa! He has heard of a summer queen from a summer land with summer magic-someone with similar powers as Elsa's, who can control fire and heat. He says her land is trapped in an eternal summer. 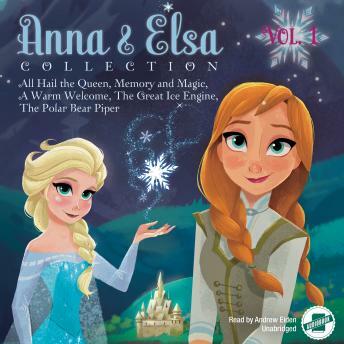 Olaf thinks it sounds great, but Elsa and Anna think she might be in trouble. Either way, a journey is in order! Anna has an adventurous spirit. Elsa has magical power over ice and snow. Together the sisters explore the mountains, palace, fjords, and beyond as they finally get to know each other as sisters-and friends. Even though Arendelle is a cold, snowy place, polar bears are still a very rare sight-until now! A family of polar bears has appeared on the outskirts of town and have started to cause mischief. Olaf loves the bears, but Elsa and Anna need to find out why they have suddenly appeared-and how to get them back to their Arctic home!